We give out art tours! In line with artmejo’s mission to promote local artists and galleries, we give out Art Tours with Airbnb, covering two areas in Amman that have become the capital’s main cultural and artistic hubs. 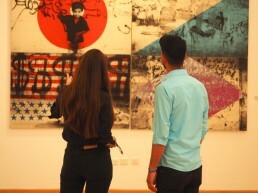 Through these tours, visitors learn about the history of some of Jordan’s most prestigious art galleries and get a glimpse into the contemporary art offered by elite local and regional artists. While walking from one gallery to another, there is a street art tour component where we take a quick look at the recently emerged, flourishing street art scene in Jordan and talk about the local and international artists who have left their print on the streets and buildings of Amman.